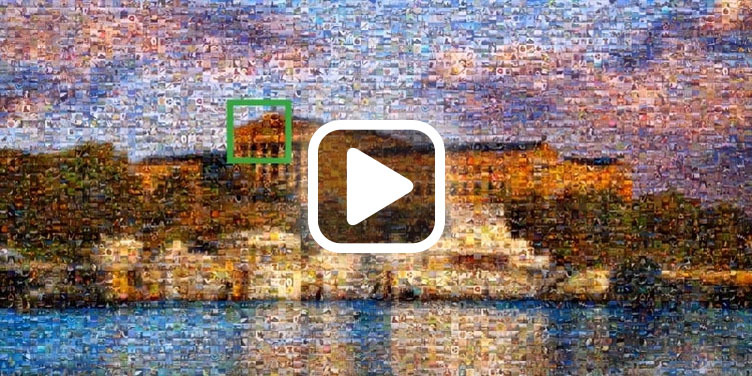 Picture Mosaics - What makes a TRUE photo mosaic? What makes a TRUE mosaic? not all mosaics are created equal. An overwhelming amount mosaic companies and software tend to use cheap methods, resulting in fake or “untrue” mosaics. This has kept us motivated to always create “true” photo mosaics. What is a true photo mosaic? We’ve developed a list of five essential, tried-and-true elements required to create true mosaics. Choosing the optimal cell size will help reach the best possible photo mosaic result. The cells should be large enough to be easily seen with the naked eye without compromising the clarity of the original source image. A true mosaic will utilize the colors and shapes within each cell photo to properly recreate the source image. A cheap workaround, called source ghosting, is to superimpose the source image on top of the mosaic. This cheap method results in a fake mosaic, and it shows - take a close look before you choose your photo mosaic solution! Colorization is the process of altering the colors within the cells to more closely match the source image. A true mosaic will use little to no colorization. Colorization can sometimes be necessary, but we’ve carefully developed our mosaic software and process to avoid using colorization whenever possible. Each cell image should be properly cropped, aligned, and placed in its most fitting location within the mosaic. Cells should never be stretched or forced into a less-than-optimal location. Our software is specially designed to properly place each cell image, giving the final mosaic spectacular clarity. The small detail of the cell images requires a high print resolution in order to be retain clarity. Using the highest quality paper and inks, our photo mosaics are printed at 2,880+ dpi on our state-of-the-art Epson large format printers.